The Adirondack chair comes in various names such as Cottage chair, Muskoka chair, Laurentian, Westport plank chair, and Miles Comins chair. 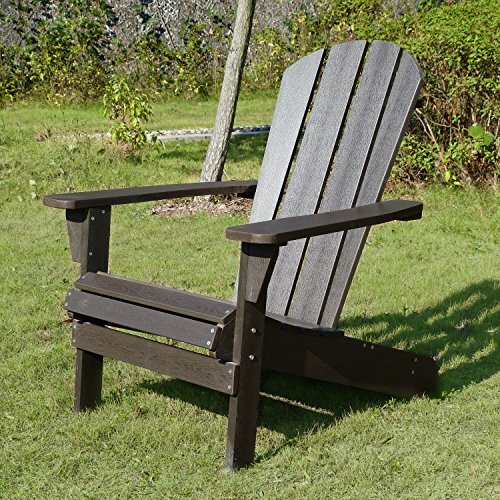 The first Adirondack chair was created in 1903 by Thomas Lee who couldn’t find a comfortable outdoor chair for his country cottage in Westport, NY, near the Adirondack mountain region. After testing out several prototypes, Lee and all 22 of his family members decided upon the slanted-back, broad-armed wooden chair. Lee shared the design of this chair to his carpenter friend, Harry Bunnell, who later took the design and received a patent for it in 1905 without Lee’s knowing. Bunnell called them the Westport Chairs, which became popular in Europe and in mail-order catalogs for over 20 years. Next came Irving Wolpin, who received a patent in the 1930s for his own interpretation of the Adirondack chair. It was also Wolpin who gave the iconic chairs its name, Adirondack. Traditional Adirondack chairs have been popular for several decades now. These types of chairs can be commonly seen in people’s backyards. People use them for patio furniture, and they are generally thought of as one of the most comfortable options for lounging. These chairs are so well-liked due to being large and allowing the people sitting in them to sit at a bit of an incline. The way that you sit in an Adirondack chair is a bit different from other types of outdoor furniture. The seat is angled backward, but the back of the chair is completely straight. This allows you to feel like you are sitting really deep in this chair, and many find it to be quite comfortable for lounging on a nice sunny day. The wide armrests are another popular feature of these chairs that add to the overall enjoyment. It should be noted that these chairs are not necessarily meant for being used for many hours at a time. They can be comfortable for lounging for a few hours, but sitting in them any longer than that will be tough. You may start to feel uncomfortable after a bit and will need to get up. It is a bit easier to lay out in one of these chairs if it is longer, but your mileage will vary depending on your body type. The Adirondack chair that is being used as an example here is quite nice. This is a very basic Adirondack chair that will look perfect on your patio or in your garden area. It will be a comfortable seat for spending a bit of time outside. If you need an interesting piece of furniture for your deck or patio, then you will want to consider getting an Adirondack chair. There are also many Adirondack chairs that come with Ottomans. These special Adirondack chairs are more well-suited to lounging around on a sunny day. You will be able to put your feet up and lay in the sun comfortably for a while when you have one of these chairs available to use. They can actually be fairly nice, and there are people who prefer them to lounge chairs for short bursts of sunning. They may not be as comfortable as long lounge chairs for longer lounging sessions, though. These chairs will be perfect for sitting in the sun for a couple of hours. You will be able to enjoy keeping your feet up and sitting outside. It should feel pretty natural to lay out in the sun, but these chairs will be even better for just normal sitting. What most people wind up using these Adirondack chairs with Ottomans for is normal patio sitting. You can enjoy sitting in your chairs and having a conversation with your friends and family outside. They are great for a day out in the sun with a cold drink in your hand. These chairs will certainly be among the most popular seats at any barbecues that you throw during the summer months. This Adirondack chair here is everything that you would expect it to be. It has a traditional wood finish and looks really nice. It will fit in wherever you want to place it in your backyard. 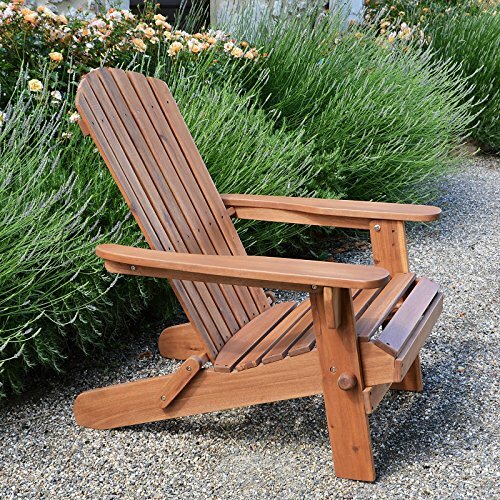 This Adirondack chair was made using weather-resistant Brazilian eucalyptus wood and will stand the test of time for you. There are many Adirondack chairs on the market, and most of them are going to be made out of wood. 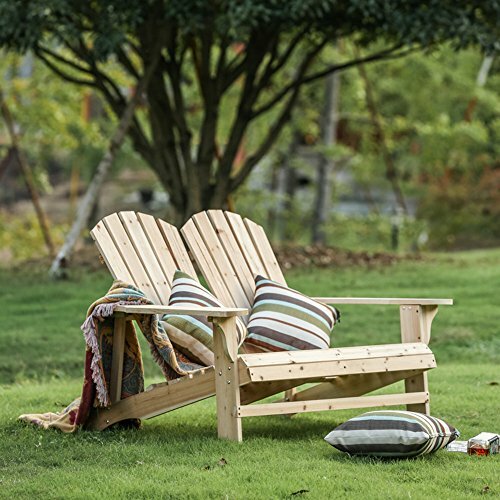 When you think of an Adirondack chair, you think of that traditional wooden look that is so synonymous with the name. There are actually many chairs on the market that are made out of hard plastic materials, though. These chairs can be made to look as if they are wood, but they’re really a type of composite material. You might not like the idea of owning a faux wood Adirondack chair if you are a purist. Many people would simply prefer to purchase a real wooden chair and call it a day. Before you completely dismiss these faux wood chairs, you should know that they actually perform admirably. The strength of the faux wood Adirondack chairs is commendable, and you will actually be able to feel comfortable while using one. These chairs are made to be very weather-resistant, as well. They work really well when used as patio furniture due to being capable of withstanding the elements. Rain and snow won’t be a problem for these faux wood chairs, and they will remain looking vibrant even after going through several seasons. In some situations, faux wood Adirondack chairs can look better after years of use than a normal chair. The faux wood Adirondack chair that is being shown here is very nice overall. It has very sturdy construction and should last you for an incredibly long time. The chair has been made out of Polystyrene and will stand up to weather conditions without having any problems. If you need a durable chair that is also pretty cost-effective, then this should work out nicely. Wicker furniture is incredibly popular among certain people. The look of wicker is really unique, and it has a certain charm to it that is hard to deny. Some people worry about using wicker furniture due to it feeling less durable than some other materials. This is actually nothing to worry about, as wicker is capable of withstanding more than you would think. A good chair made out of wicker can withstand quite a bit of weight. You should be able to use a chair like this for quite some time without having to worry about it getting worn down. It is true that wicker can be a bit more arduous to clean in some cases, but you will generally be able to enjoy your wicker furniture. This is why wicker Adirondack chairs have become a staple in so many people’s backyards. This wicker Adirondack chair is very nice from a visual perspective. You can tell right away that it is very much like the traditional Adirondack chairs that people love so much. It has been designed with the same straight back and angled seat that you would expect in a traditional wooden chair. It just has a unique visual flair that makes it that much more desirable. Any concerns about cleaning this wicker chair will be alleviated when you find out that it has been specially treated too. This chair is made to stand up to harsh weather conditions and is resistant to many things. You shouldn’t have to worry about stains, cracks, water damage, or UV damage. 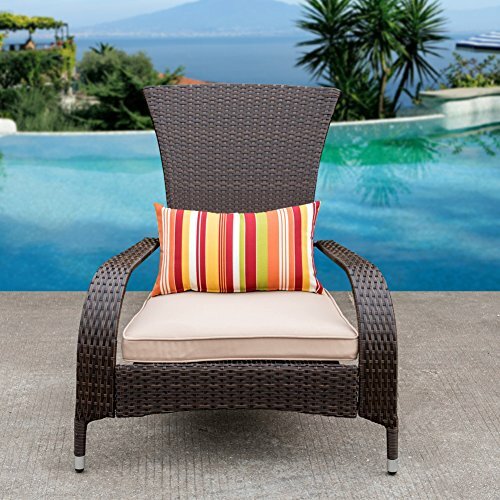 It will make a great addition to your patio area or your deck if you have other wicker furniture already. Your kids need a nice spot to sit outside with you. This is the reasoning behind the creation of children’s Adirondack chairs. These chairs are made just like normal Adirondack chairs except that they are built to be a bit smaller. You will be able to enjoy seeing your child or grandchild have fun sitting in their chair that is just like the ones that adults are using. Children won’t have an easy time trying to sit in a normal Adirondack chair. They are too big and sit too far back for their little bodies to be able to get in and out of them properly. Even normal patio furniture will wind up being a bit too big for them, and they may need help getting in and out of the chair. If you buy them a chair that is just the right size, then none of this will be a problem. Having a smaller Adirondack chair should actually look really cute next to the other furniture. It can be a special chair that is meant for your child, and it will make them feel good to know that they have their own seat. If you have multiple children, then you should be able to purchase several of these without it being a big deal. They are fairly affordable and will definitely be great patio or deck seating options for the little ones. The little Adirondack chair being shown here is meant for kids between the ages of three and eight. It is made out of a hard plastic material that is made to look like wood. It is actually very attractive and should make your kids very happy. The chair itself is very lightweight and easy to move around, so it will be great for the kids in your life. It is also possible to find Adirondack chairs that are meant for seating more than one person. You don’t see these chairs in people’s backyards as often as the traditional Adirondack chairs. Even so, this could be a great option for a couple that wants to be able to sit together. It may not be practical for people who don’t want to get too close, as you will be sitting very snugly with the other person in this type of seat. This will be really nice if you want to be able to enjoy your patio with your significant other. It’s a really cozy option that can be fun for spending a cool evening with someone that you love. People who have fire pits in their backyards love setting up chairs like this to enjoy. Being able to seat two people with one chair will be very beneficial, so having at least one of these in your collection of outdoor furniture is a good idea. The two-person Adirondack chair being shown here is going to be desirable for many other reasons, too. The wood that it is made out of is both weather-resistant and insect-resistant. You will be able to enjoy your time outdoors without having to worry so much about being pestered by insects all the time. The chair also has a beautiful natural look to it that everyone will enjoy. There are also camping chairs on the market that are said to be Adirondack chairs. When you take an initial look at them, you may not think that they resemble Adirondack chairs at all. When you take a look at how the seat is angled and how the back of the chair is designed, you will be able to tell that it is done in an Adirondack style. Some people just really enjoy the way that Adirondack chairs sit, so they have been replicated in a more portable form. People take these types of chairs on camping trips with them. They can be folded up and taken wherever you want them to go. You will be able to put it in the trunk of your car or even put it in with your other camping gear. This will give you a convenient place to sit at night when you are relaxing. 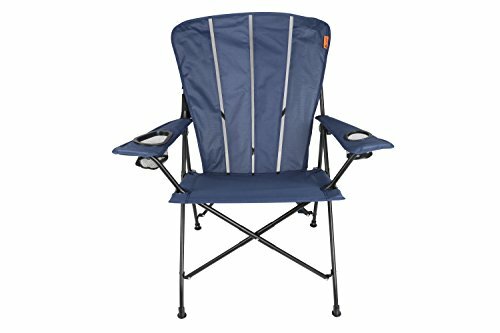 This chair even has some of the features that are more common on traditional camping chairs. For instance, you will be able to enjoy the two cup holders that are present in the arms of the chair. This will give you a convenient spot to place your beverage when you are trying to unwind. The cupholders are mesh, too, so you won’t have to worry too much if you happen to spill some of your drink. The chair comes with a convenient carrying strap, too. This will make it very easy to get it where it needs to go. Even if you have to take this chair on a bit of a hike to get to your camping spot, it won’t feel too onerous. This is a good portable chair that allows you to enjoy a bit of the comfort that a traditional Adirondack chair can offer.